A little while back in Las Vegas we met up with friends who are locals, and we dined at Strip House in Planet Hollywood. We ordered a starter that ignited my Katrina’s Kitchen curiosity and is my inspiration for this recipe. So here we go stuffing prosciutto. 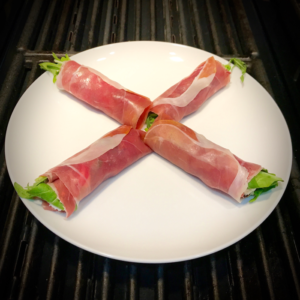 Take strips of prosciutto and lay them out flat separately on the wax paper they are packaged with. 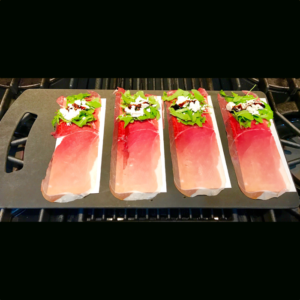 Place a small amount of arugula on each end of prosciutto, clustered more towards one end. Place crumbles of goat cheese on top of the arugula. Drizzle with Gourmet Blend’s Original Balsamic vinegar. It is my preferred balsamic vinegar. You can use another balsamic brand but make sure it is good high quality with a slightly thicker consistency. Roll it up. Your prosciutto rolls are now ready to serve. Yum. Gluten free, no carbs, healthy, finger food, keto, no-cook recipe, appetizer, party food.